Have you ever tried to paint using a stencil? While it may sound like an easy task, easy isn’t usually how a stencil project ends. I am sure you can imagine the stencil moving ever so slightly, or the paint bleeding under the stencil leaving a smeared mess. We’ve all been there, right? Now imagine a stencil project on a much larger scale, like say a DIY parking lot stencil job. We’re not saying that DIY parking lot striping is impossible, BUT it certainly takes a high level of skill and extreme precision. Did you know that parking lot paint isn’t just about straight lines but also needs to follow a number of strict traffic and ADA rules and regulations? Read more on this in our blogs, It’s More Than Just Straight Lines and ADA Regulations & Required Number of Accessible Spaces. If you are attempting a DIY parking lot paint job you’ll need to start with the stencils. The first step of creating a stencil is retrieving the proper materials to do so. You will need sheets of LDP or Low Density Polyethylene. A 4×8 sheet will run you about $20. Once you have the material you can lay it over an existing marking like a handicap logo. To do this, you would trace the marking onto the LDP, like you would any other stencil. This will need to be extremely precise, neat, and straight. Then the marking should be cut out with an exacto knife. This stencil will then be used as your guide when painting. Not only will you want your accessible spaces to be marked neatly, but proper marking is a requirement. In addition to the actual marking, accessible spots have certain measurements, number of spots, van accessibility requirements, etc. that must be adhered to as well. For your lines, you’ll want them to be straight and as parallel as possible. This will require intricate measuring and chalking out a guide to follow prior to painting. Each space will need to be at least 9’ wide to allow room for cars (unless it’s a compact space). Each line should be the same length (typically 18’). You’ll also need to consider proper aisle width between stalls. This will differ for each parking lot as well as each parking stall type and size. Your parking lot striping not only adds to your property’s curb appeal, but it also dictates important traffic flows, safety regulations, and ADA regulations. A parking lot paint job that is not researched heavily and planned out precisely can end in, not only an awful looking result, but may also lead to other costly damages like traffic accidents, or ADA compliance fines. 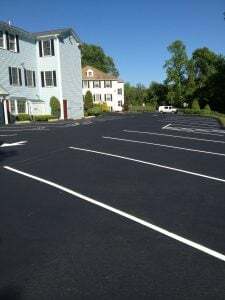 While it may seem like parking lot striping is the easiest asphalt paving task to DIY, it actually is one of the most complicated and truly should be left in the hands of a professional. 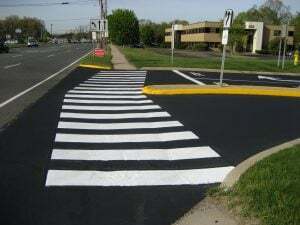 A lot goes into proper lot striping, and because of this an extensive knowledge base, precision, and professional grade machinery is required. If your parking lot needs to be painted, rely on the professionals to cover all of your bases! Contact EastCoat Pavement Services for your free consultation!